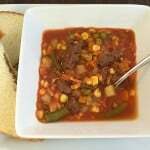 A hearty tomato based soup bursting with flavor from peak harvested vegetables and tender juicy beef dices. Place all of the ingredients into a large stockpot. Bring to a boil over medium heat. Stir. Cover with lid and simmer for 10 minutes. Stir occasionally.